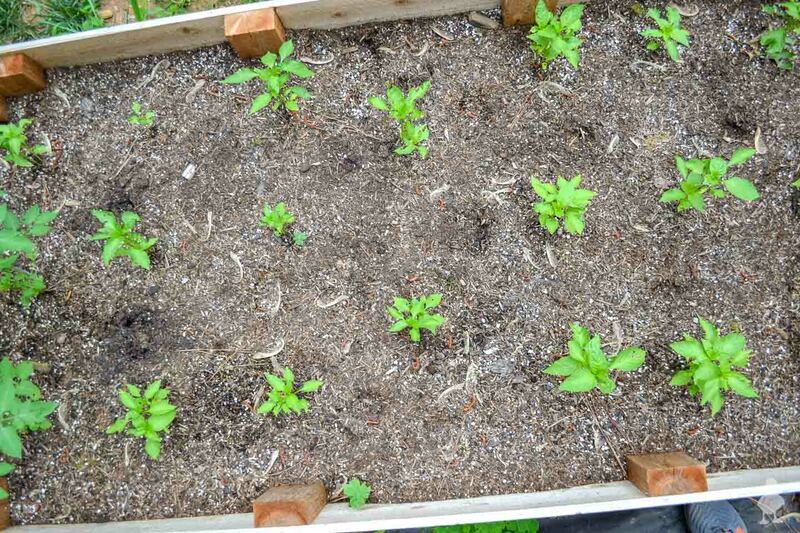 My vegetable seedlings popped up quickly this spring, which meant I needed a garden bed — FAST! 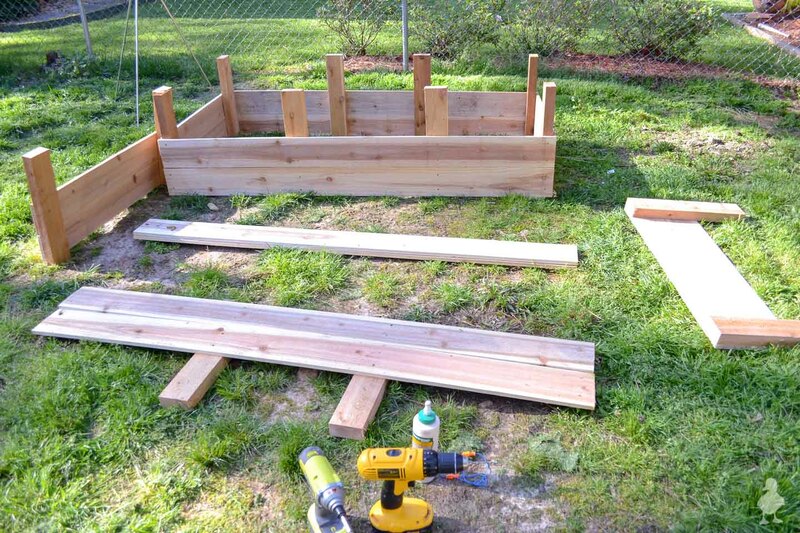 Check out how I made this cheap & easy L-shaped raised garden bed out of cedar fence pickets. 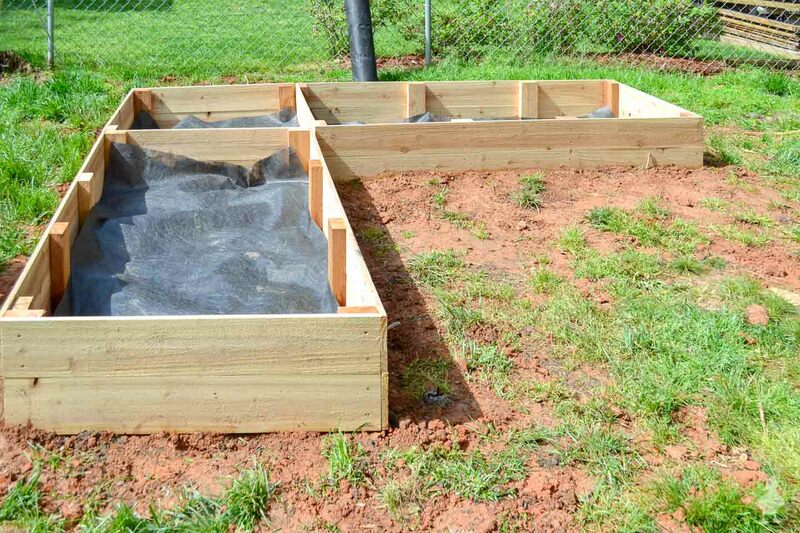 In just a few hours, I had a vegetable garden ready for growing! 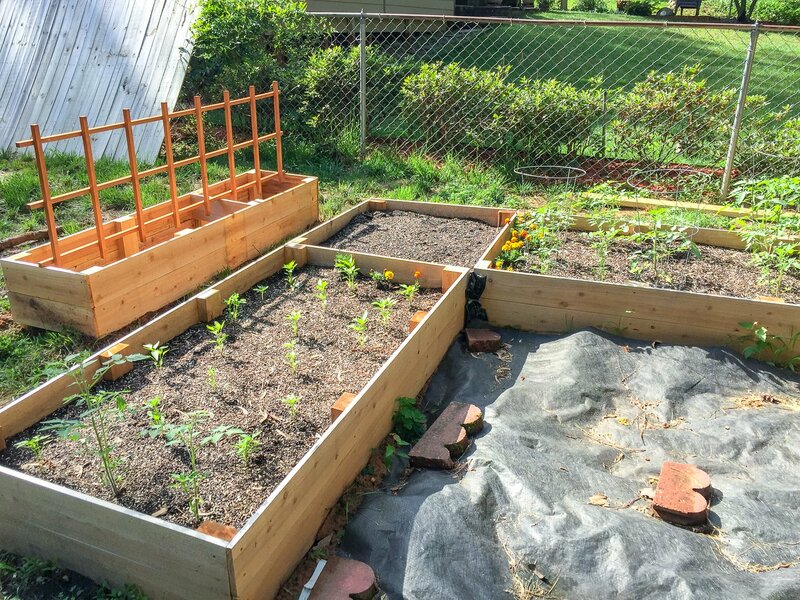 Got a new backyard update for ya today: my L-shaped raised garden bed, completed and growing strong with veggies! Since I’ve been putting some effort into doing more video this year, I have a both video tutorial and a post about it, so you can pick your poison. I say “new” because they’re new as of 2018, but in truth, they’ve been in the yard for about two months now. 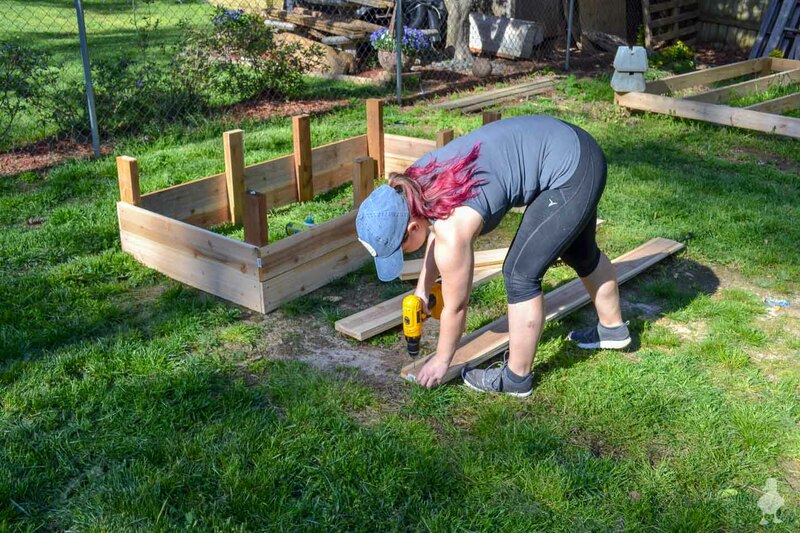 I’ve been scrambling with the deck build and getting the shed underway, but I think it’s probably best to share the garden build before the new veggies — which are starting to grow in, so I need to get a move on with this post! Like last time, I bought dog-eared fence pickets, but went with cedar for a way to change it up. 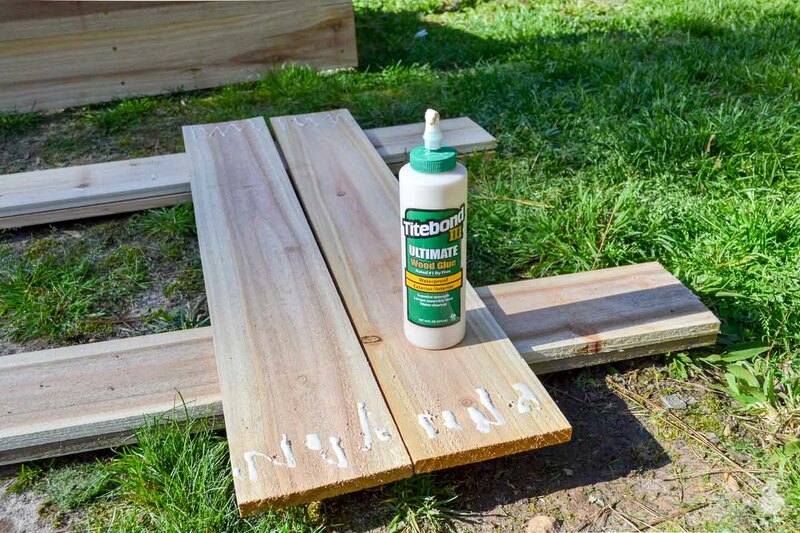 Cedar has natural oils in it that resist rot, so they’re great for an application like this. I also picked up cedar 2x4s and cut all the pieces down. ** You can make these longer if you have to concern yourself with frost or whatever (in Georgia that’s not really a thing I think much about), but I know my friend Kit from DIY Diva cuts hers to 19 inches and lives in freezing cold Michigan, if that helps! 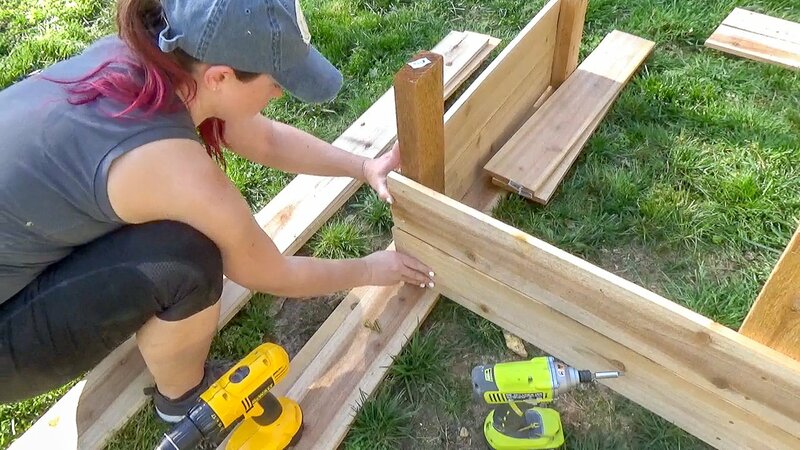 Be sure to pre-drill the boards; they risk splitting if you try to screw into them without! I screwed the sides in panels and eyeballed the spacing of the supports along each longer side (see above for a visual example). Since I was installing on unlevel ground, I used some of the not-yet-installed pieces to create a more level surface for stacking. 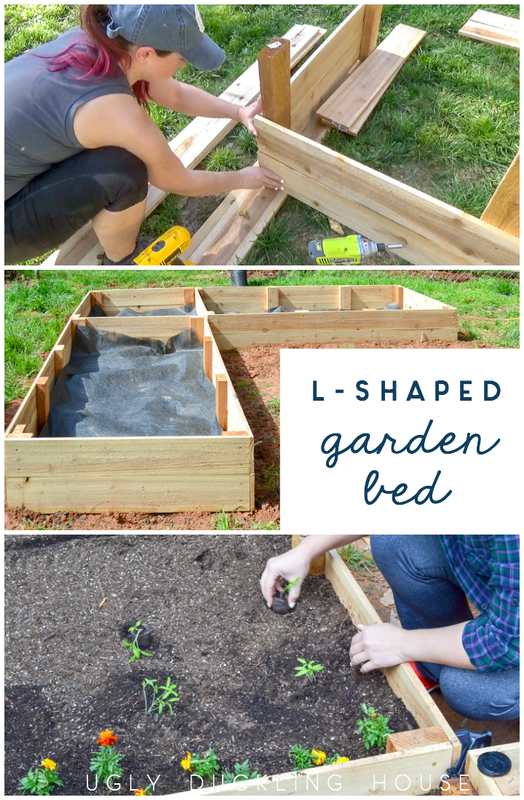 For the corner bed, I didn’t actually build an entire other bed; instead, I used 2 boards, cut each in half, created the corner, and screwed it to the other two beds to form an L.
Once it was all flipped over, it was ready for digging. Georgia red clay is no joke. But after wrestling with the shovel for a good while, the bed finally succumbed and sunk into the ground. Then, I added some landscaping fabric to help block weeds from the bottom (a MUST if you have a weed-prone yard like mine). 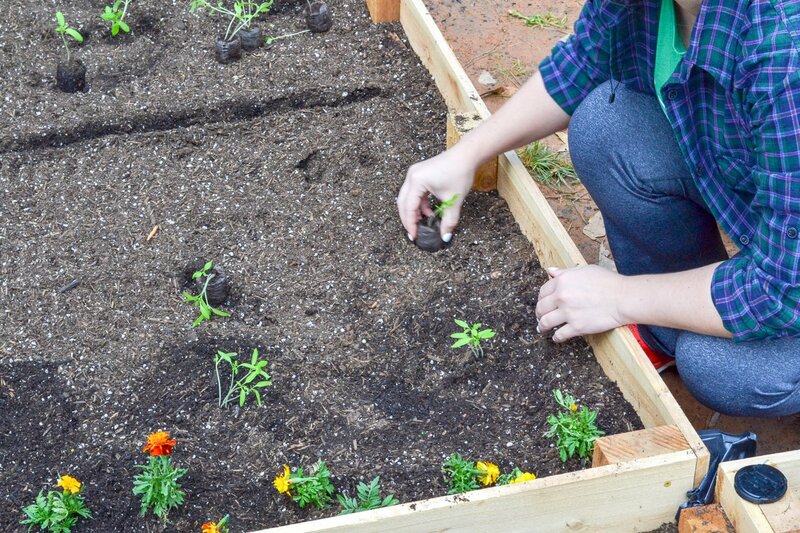 Then, I began layering in organic material, similar to how I layered in the raised garden beds for my gardenias. 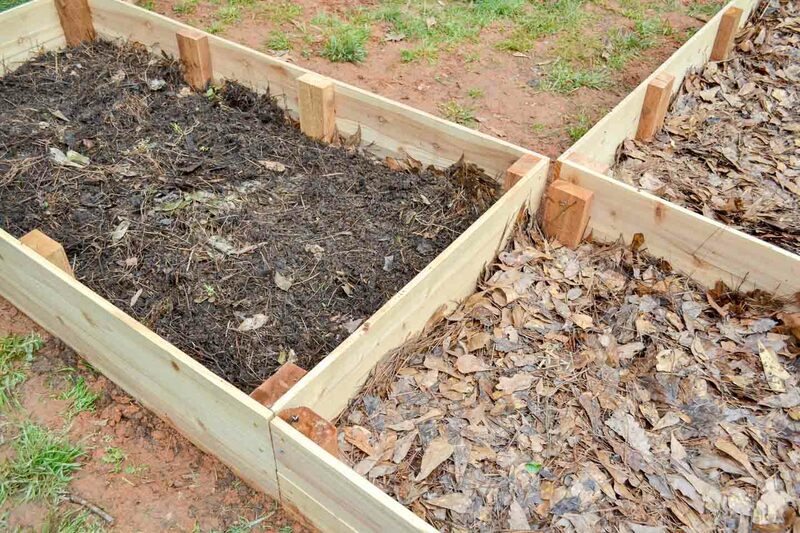 This “lasagna” method helps to get a good layer of weed-blocking matter toward the bottom, and then compost on top. 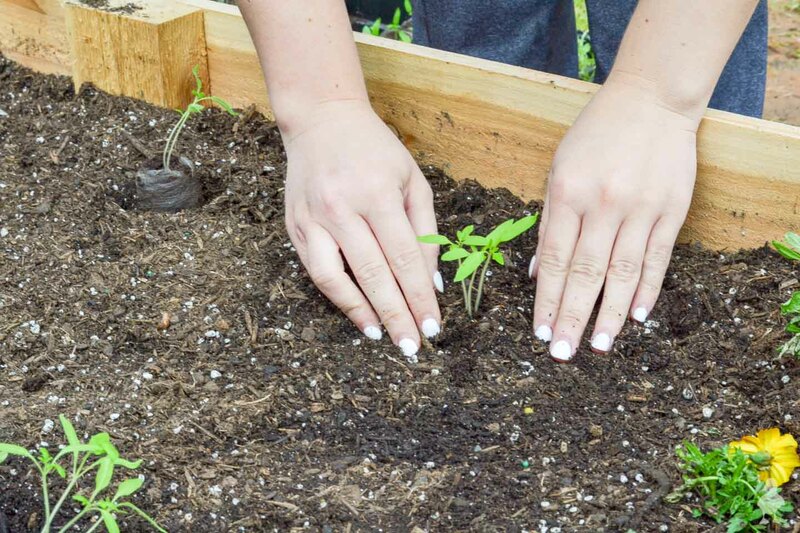 K and I have been putting in a lot of effort to save our veggies as we cook and put them in a compost pile (which, coughcough, I need to build into a more practical compost setup so it’s more contained, but it’s not really a priority right now). 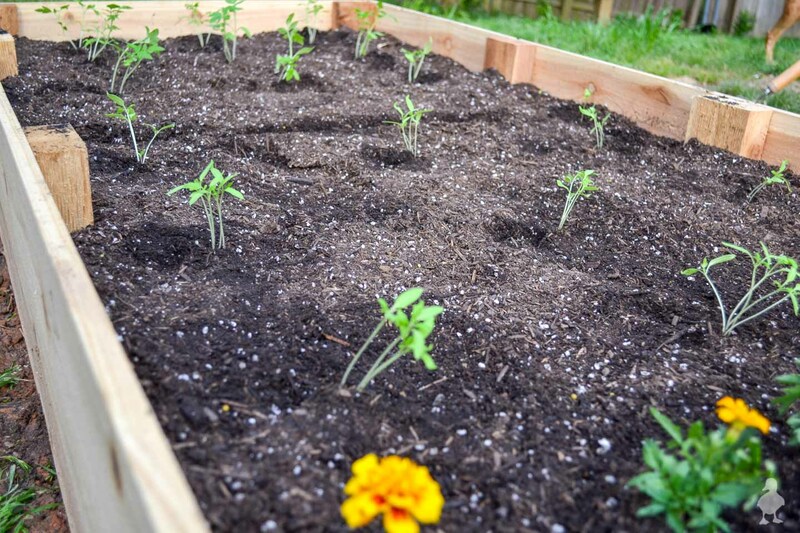 Lesson learned: you need a LOT of compost, even for tiny gardens! 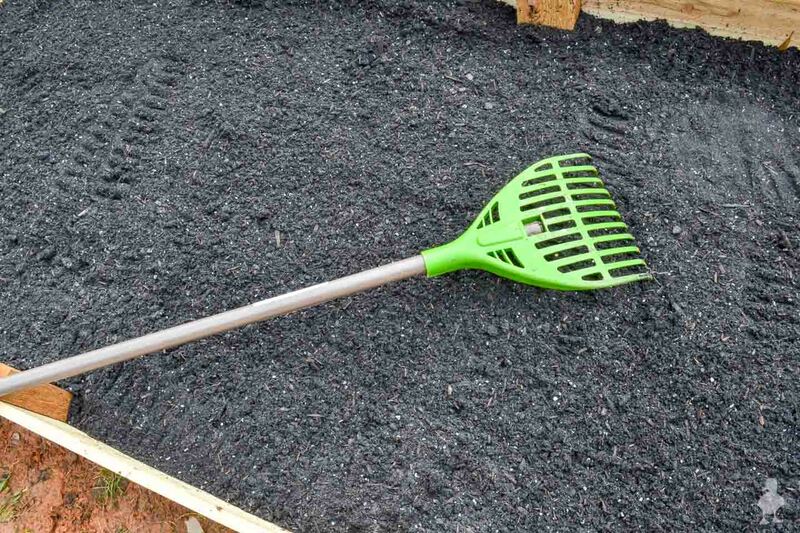 After a trip to the supplier for more composted soil, the beds were ready for the seedlings. There are also onions and carrots that have just recently started popping up, so there will be lots of new pics for the next garden update. 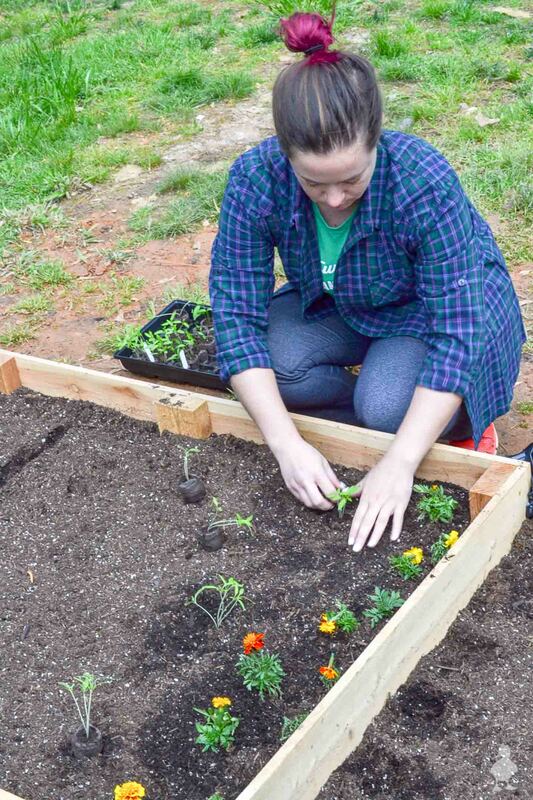 I wound up building another, skinnier bed for cucumbers with a trellis… which was a little tougher since the landscape in that spot still has roots from the tree removal. 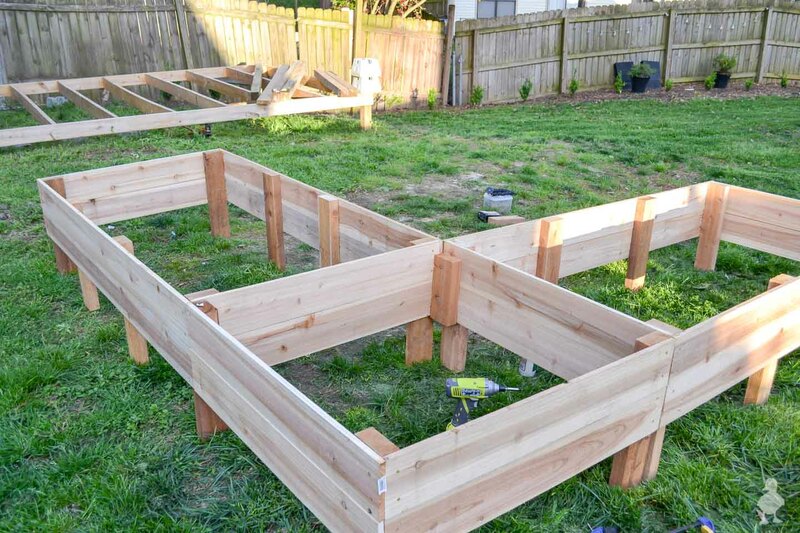 If anyone is struggling with that and would like a separate tutorial with some tips on getting a garden bed to work (somewhat) level on an uneven landscape, please let me know! Ready for some sneak peeks of things? As I mentioned, this new garden has been in place for a couple of months now, and nearly everything around the bed has been changing. So, that means from just about every photographic angle, there are some crazy updates going on right next to this that I haven’t shared fully yet. There are a ton of things coming this month, and it’s full-steam ahead with lots of building (which is how we’ve gotten into this pattern of no updates, then a giant swarm of them, and then another quiet period while I continue building… I think a nap is in my future). The new deck is now done, so I have at a minimum of two more posts coming for that. The pub shed, as you can see, is underway, and we’ve been grilling out every night for the last week. It’s a lot. A lot of a lot. At the end, I’m hoping to also give you guys an update on the travel trailer (it has a name, I’m trying to come up with a pretty piece of art for its new name, and we should be starting on the restoration — coughcough gut job — very soon!). 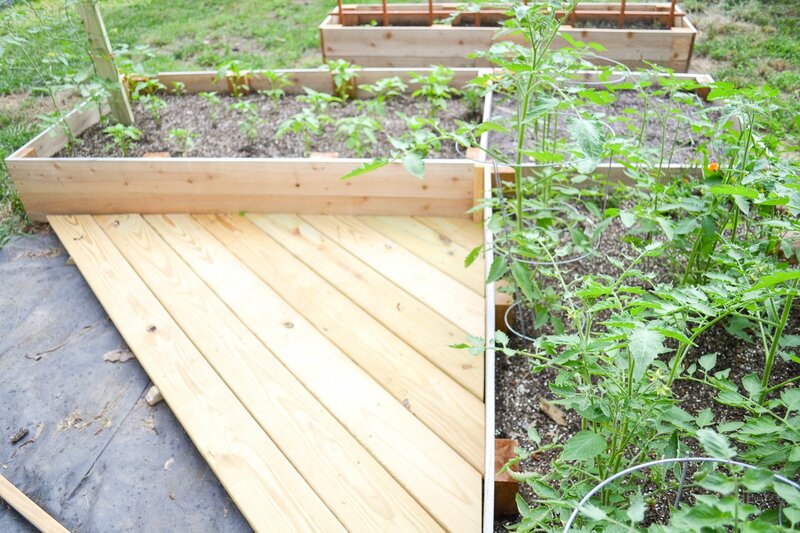 My vegetable garden also has a small little deck thanks to some extra decking materials left over. 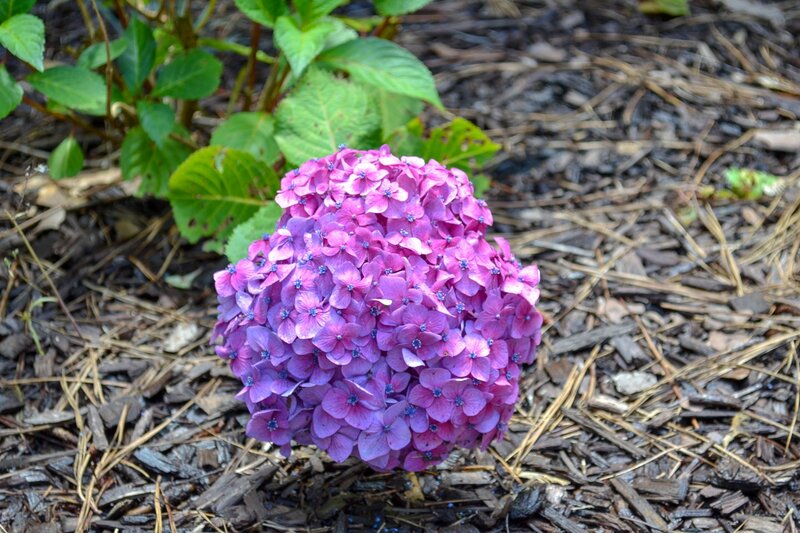 It’s been great during these crazy rain storms this spring. I’ll have a separate tutorial for you on that (should be by next Thursday)! Anyway, that’s what’s going on around here in a nutshell. What have you been building/growing/DIYing lately? Haha yes! I am looking forward to taking a break and enjoying all the new builds soon (I hope next month, if all goes as planned). This garden spot LOOKS awesome! Well done. Love seeing you in the pics. Thanks Sharlene! So glad you like this post! For the last month or so, I’ve read EVERY single post since 2011. I just bought a 1961 MCMish house that needs updating and plan to do as much of it ourselves as possible. 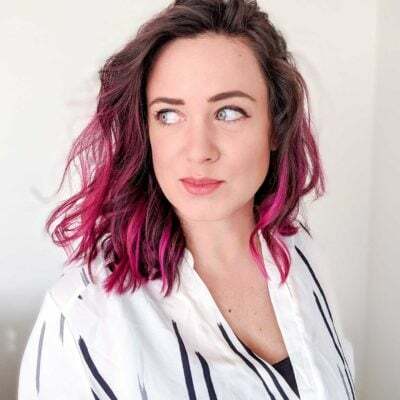 Which is how I got to your blog- looking at the detailed DIY posts thru Pinterest. It’s been crazy to watch (read) how this blog has transformed from updates for friends/family to a business/brand. When you buy a home everyone tells you just to do things a little at a time & it will come together and your blog is proof of that! 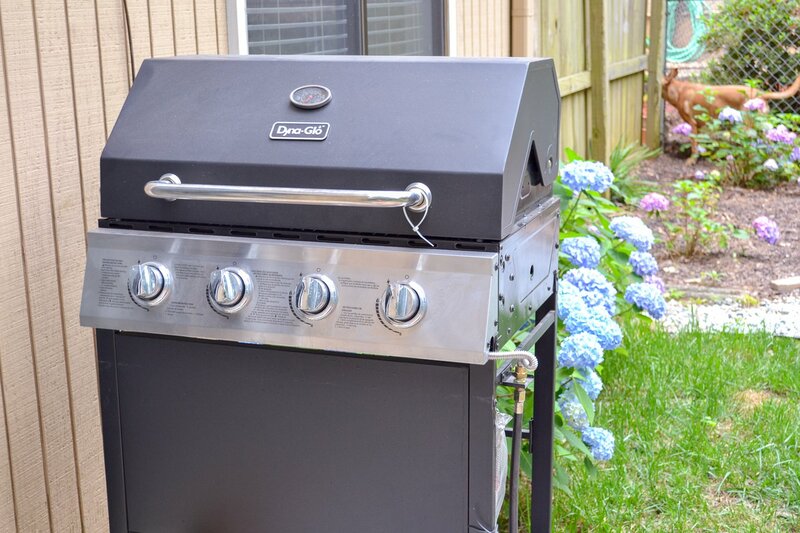 I do miss the reno project heavy first years of the blog but as a home owner – I bet you don’t. Thanks for all the hard work & step by step guides – it’s appreciated! Wow, that’s some reading dedication! Yeah, the reno days aren’t as filled with grime and overwhelming grit. It feels like it took so LONG, where I was just barely getting by and had very little to show for my work. Now, I finally have a HOME. And that opens doors to take on so many different projects I never thought possible (like how my boyfriend K and are about to take on his family’s vintage trailer… as soon as the shed is done, that will be a brand new gritty reno job!). I am so glad you found the posts on my blog helpful, Cecylia! Reading a comment like yours has made my day. This is such a cute article. My family and I have very limited space for our garden and have basically just let the cucumber vines spread onto the porch as they see fit. 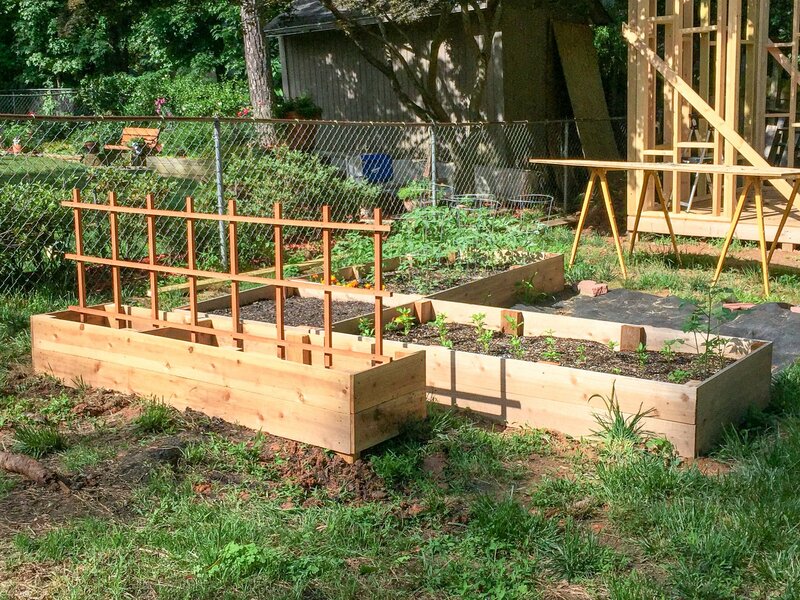 You have a picture with a…what looks like a home-made… trellis that will work wonders. 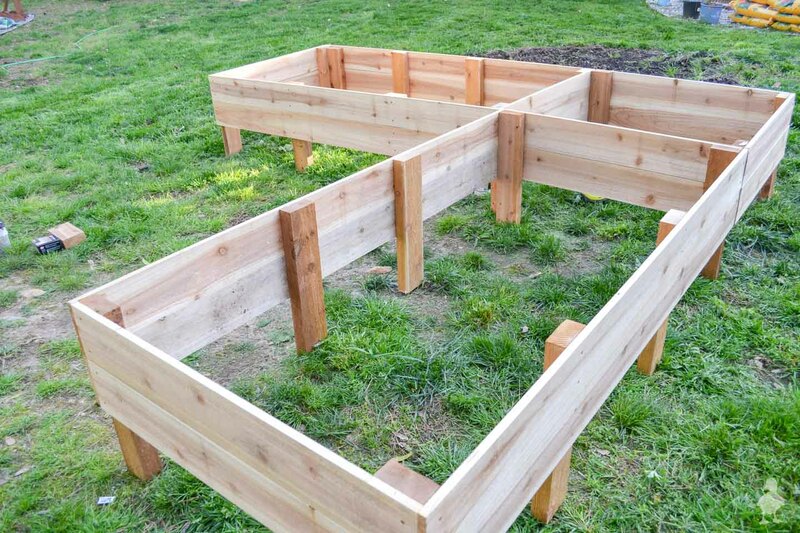 I am inspired to make this L-shaped raised garden where we currently have a patio. Thanks for the inspiration!